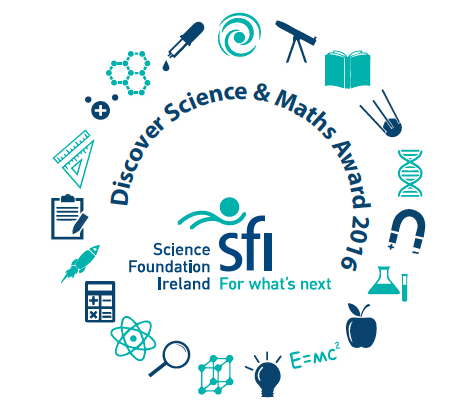 Well done to all pupils on being awarded the DPSM plaque of Science and Maths excellence for the fifth year running. energised and ready for the busy day ahead. from the 23rd to the 27th of April as we held our first Active school week. gymnastics, rounders and Irish dancing. Pupils participated in the Inter-Schools Debating Competition organised by Laois Education Centre again this year. 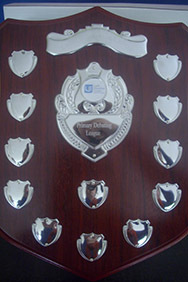 St Paul’s were the overall winners for two years in a row (2015, 2016 and 2018). In the 2016/2017 school year pupils achieved awards in the Mountmellick Credit Union Art Competition, Mountmellick Drama Art Competition and the Junior Painter of the Year Competition. Artwork submitted by first and second class pupils resulted in them winning an overall prize in the National Dairy Council Art Competition. 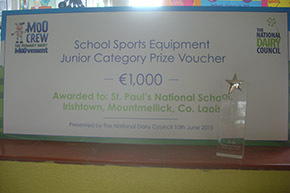 The school was awarded with a free trip to Causey Farm in Navan, €1,000 worth of sport’s equipment and a coaching session with Derval O’Rourke, the Olympian athlete. Everyone had a fantastic and memorable time at Causey Farm. Well done to the competition winners! Well done to all the pupils who wrote books in the Write a Book Competition. It is a great achievement to be an author. Pupils collected their awards at the Awards Ceremony in the Heritage Hotel, Portlaoise on Thursday 15th June. Well done one and all. Well done to all the pupils who wrote such wonderful Irish books. An awards evening was enjoyed in the Heritage Hotel in March. The school was delighted to welcome Noel and Liz McMeekin as well as parents and friends for the Postal Bible School Prize-giving on 5th April. The school made a submission regarding the School Admission Bill to the Minister for Education and was represented at a meeting held in Croke Park on Monday 29th May.